Vegan cooking and baking is so trendy at the moment. And that’s a good thing, because the recipes are tasty and versatile. And cutting down on animal products is a conscious decision to help end the suffering of millions of animals. I am not a vegan, but a vegetarian. Why? Because being a vegan is just so much more than just cutting out meat and the obvious animal products like milk. For instance, I don’t buy leather products anymore, but am still using and wearing the ones I have. Also I love honey and when I buy it I make sure that it comes from small local beekeepers who take pride in their work and look after their bees. So by strict vegan standards I cannot call myself a vegan. But you don’t have to fit into every category. If like me you are trying to make a change regardless of what it’s called and love chocolate then this recipe is definitely for you: A vegan chocolate mud cake aka a dairy- and egg-free chocolate mud cake. I got this recipe from Sarah Wheeler from Sarah’s Cakes & Things who kindly let me post and translate it. It uses Australian cups (250 ml) so I have measured out the corresponding amounts in grams and written them in brackets. *) A small tip: As the coconut cream settles at the top of the tin, tip the 2. tin into a separate bowl. Using a small whisk stir in the firmer cream into the milk. I popped it into the microwave for 10 seconds. This way you have exactly 400 ml and can measure the required amounts accurately. 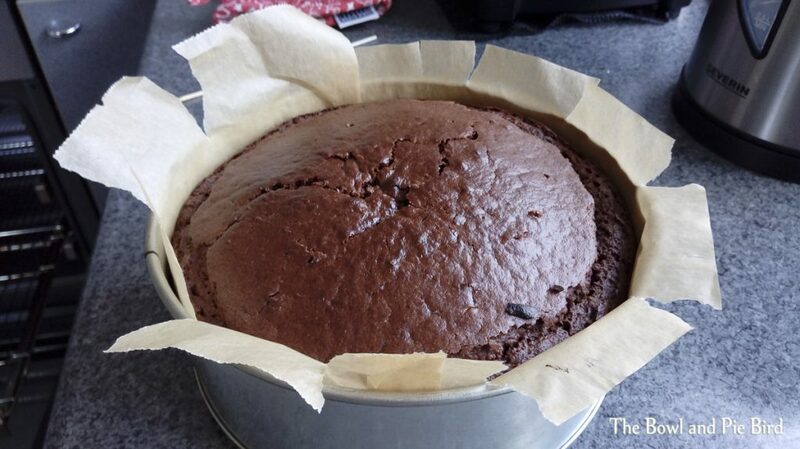 **) I can’t buy self raising flour in Germany so I found an easy guide on Nigella’s website. She recommends adding 2 teaspoons of baking powder per cup of flour and also ¼ teaspoon of bicarbonate of soda if baking with cocoa powder, yoghurt or buttermilk as these ingredients often need a little boost. When I worked it out I thought “Crumbs! That’s a lot” and checked a few other sites which recommended 1,5 teaspoons baking powder per cup of flour. So in end I used the 1,5 teaspoon measurement and Nigella’s tip with the bicarbonate of soda. So I added 3 ¾ teaspoons of baking powder and half a teaspoon of bicarbonate of soda. Chop 150 g chocolate and put it into a saucepan with 625 ml of coconut milk and the vanilla extract, heat gently, stirring continuously until the mixture is smooth. Sift flour (with additional baking powder and bicarbonate of soda), baking powder and cocoa together into a large bowl. Stir in the sugar with a whisk. Make a well in the flour and pour in the chocolate/coconut milk mixture. 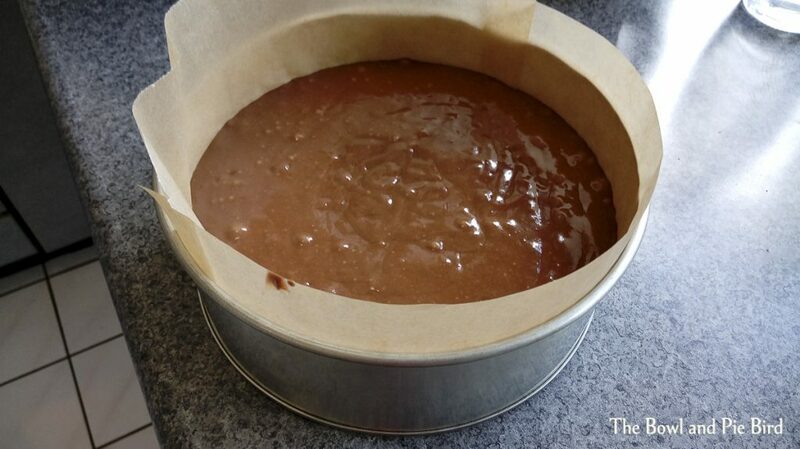 Whisk well to combine and pour into your prepared baking tin. Chop the remaining chocolate and place it into a bowl. Bring the remaining coconut milk just to the boil and pour over the chocolate. Cover for 1 minute then stir gently until the ganache is smooth. Let it stand for two hours to cool and thicken. Decorate your cake as you like with the ganache. 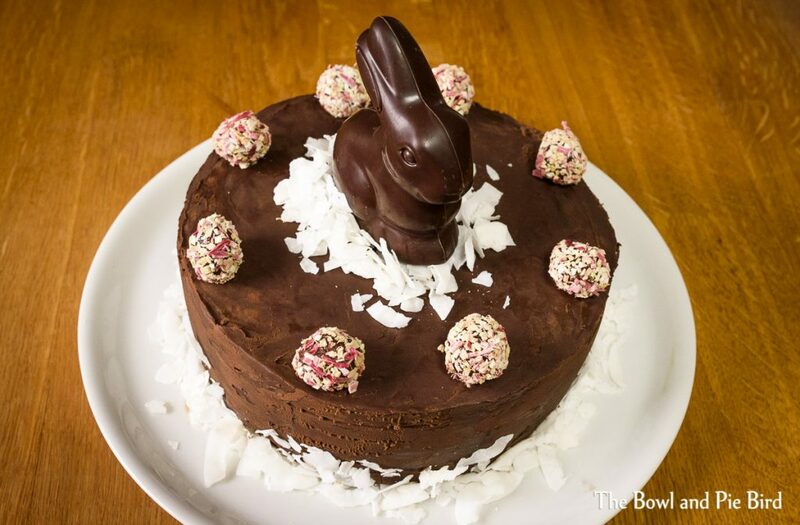 As mud cakes are very moist I only covered the outside with ganache and decorated the cake with a vegan chocolate Easter bunny and strawberry & rhubarb date sweets. This really is such a good cake! Thanks again, Sarah for sharing your recipe! 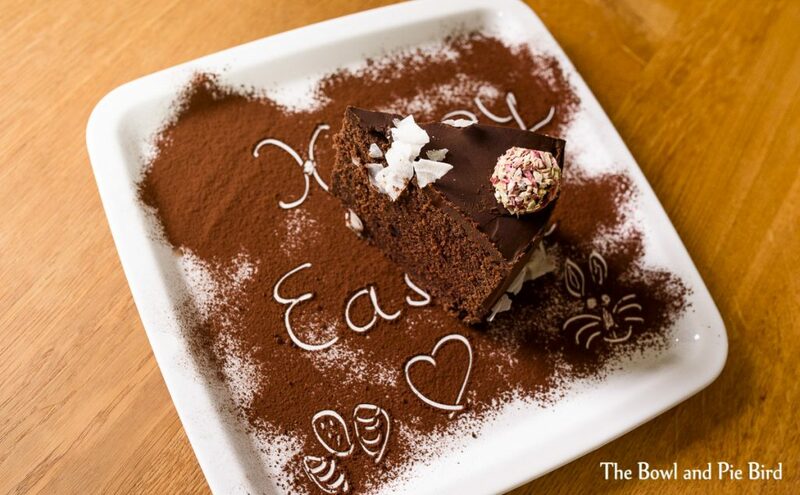 This entry was posted in Cakes and tagged chocolate cake, coconut milk, Easter, Kokosmilch, Ostern, schokoladenkuchen, Vegan.